VietNamNet Bridge - Ha Long Bay, attracting over 3 million domestic and foreign visitors each year, has to bear tons of garbage and tens of thousands of cubic meters of untreated waste water each day. At 3 pm every day, about two tons of garbage are transported by specialized ships to the central wharf of Ha Long city, from which it is carried ashore for treatment. This is the volume of garbage collected by 30 environmental sanitation workers throughout the day across Ha Long Bay, from the rubbish in caves where travelers visit, to waste in fish cages and floating waste on the sea surface. Bottles, cans, plastic bags, vegetables and other garbage are included. Ha Long Bay, attracting over 3 million domestic and foreign visitors each year, has to bear tons of garbage and tens of thousands of cubic meters of untreated waste water each day. According to the Ha Long City Management Board of Public Services, the local budget had to spend VND4.5 billion last year to collect waste on the bay. Solid waste really affects the landscape of the bay and the city, but it is not the biggest threat to the environment. It is tens of thousands of cubic meters of waste water discharged into the bay every day which causes a big headache to local authorities and people. A report of the Ha Long Bay Management Board showed that in some highly populated areas such as Cam Pha City, Hoanh Bo and Van Don districts and Quang Yen Town, there is no waste water treatment plant. This means that the waste water now goes directly from residential quarters to Ha Long Bay without any treatment. In Ha Long City’s central area, there are four waste water treatment stations. About 15,300 cubic meters of domestic waste water is discharged each day. Meanwhile, the stations can deal with 35 percent, while the total waste water of the city is over 30,000 cubic meters a day. Nguyen Van Trinh, deputy director of the Ha Long Urban Environment JSC, which runs the four waste water treatment stations, said the problem is infrastructure development. According to Trinh, many residential quarters have been built in recent years which do not connect with the central water inlet sluice system. Also, only 35 percent of waste water can be treated under a project funded by Denmark in 2008. 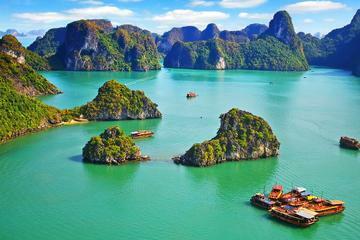 Ha Long Bay also bears waste water from petroleum units, mechanical engineering workshops, mines, shipyards and building material factories. Vinacomin’s 35 high-tech treatment stations can only treat 74 percent of the waste water from mining.